ELEVATE is one of the leading proponents of segmentation for increased impact in responsible sourcing programs. We’ve hosted several Segmentation webinars in the last few years, starting with Supplier Segmentation: Allocating Resources Where They Count in August 2014. In that webinar, we began talking about segmentation for the first time and its potential impact on factory performance and workers’ lives. The second webinar was held in September 2016. 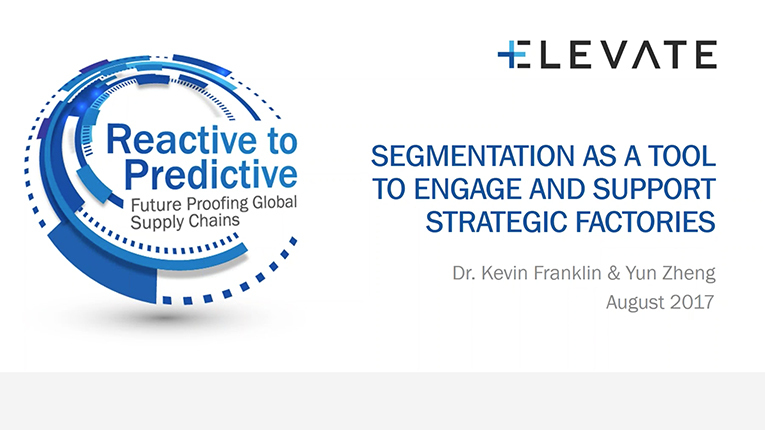 In this webinar, Supply Chain Segmentation: Prioritization that Maximizes Impact, we were able to draw from two years of consulting engagements plus program development assignments focused on program effectiveness and supplier ownership. We shared how this experience helps provide guidance on how you can build your own segmentation model and fund each segment. Segmentation assumes that the retailer / brand / vendor is willing to change the one-size-fits-all audit model and create something more tailored and impact oriented. This shift can be daunting since a segmented approach comprises a tapestry of solutions. In our webinar on 30 August 2017 (Americas) and on 31 August (Asia / Europe), we’ll build on the momentum gained from our segmentation expertise. We will dive into the practicality of identifying the types of remediation programs necessary to support strategic factories, while also providing specific advice on how to develop a roll-out plan. Come join Dr. Kevin Franklin and Yun Zheng for an information-packed hour.